Uracil-DNA Glycosylase catalyzes the hydrolysis of the N-glycosylic bond between the uracil and sugar, leaving an abasic site in uracil-containing single or double-stranded DNA. The enzyme shows no measurable activity on short oligonucleotides (<6 bases), or RNA substrates. A recombinant E. coli strain carrying the Uracil DNA Glycosylase gene from E. coli K-12. 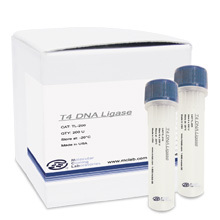 1 unit is defined as the amount of enzyme that catalyzes the release of 1.8 nmol of Uracil in 30 minutes from double-stranded, tritiated, Uracil containing-DNA at 37°C in 1X UDG Reaction Buffer. 1. M. C. Longo et al., Use of uracil DNA glycosylase to control carry-over contamination in polymerase chain reactions. Gene. 93, 125-128 (1990). 2. P. Vanghan, T. V. McCarthy, A novel process for mutation detection using uracil DNA glycosylase. Nucleic Acids Res. 26, 810-815 (1998). 3. T. A. Kunkel, Rapid and efficient site-specific mutagenesis without phenotypic selection. Proc. Natl. Acad. Sci. USA. 82, 488-492 (1985). 4. P. R. Devchand, et al., Uracil-DNA glycosylase as a probe for protein-DNA interactions. Nucleic Acids Res. 21, 3437-3443 (1993). 5. P. M. Booth et al., Assembly and cloning of coding sequences for neurotrophic factors directly from genomic DNA using polymerase chain reaction and uracil DNA glycosylase. Gene. 146, 303-308 (1994).